As the US budget deficit grows each day, it could be a good idea to not waste precious tax money on unneeded projects. But what is an unneeded project and what is anneeded project is not always easy to determine. A few months ago, an article traveled across the Internet with the topic Army says no to more tanks, but Congress insists. The article tells the story of the M1 Abrams tank, which is the main tank used by the US military and was often seen in images from both invasions of Iraq. 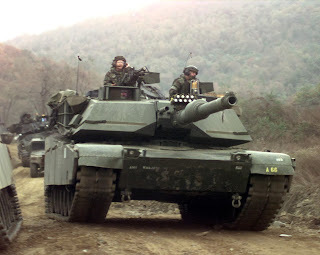 The tank has been in production since the 1980s by General Dynamics Land Systems and more than 10,000 have been built. The M1 tanks are produced at the Lima Army Tank Plant with a workforce of 700 people. The problem now is that the army has enough tanks (they have 2,400) and planned to close the factory from 2013 to 2016 to save $1 billion. In 2017, the factory would be reopened to upgrade existing tanks. But General Dynamics Land Systems argued that closing the factory would cost $380 million and restarting production would cost $1.3 billion. There are 560 subcontractors involved in the M1 Abrams tank program with a workforce of 18,000 people. To to save money, the US Congress wanted to spend $436 million on upgrading tanks the army has no use for. "People can't sit around for three years on unemployment insurance and wait for the government to come back. That supply chain is going to be much more costly and much more inefficient to create if you mothball the plant." The discussion of the M1 tank can be compared with FOGBANK, which is a secret material used in nuclear weapons. The material is classified. Its composition is classified. Its use in the weapon is classified, and the process of manufacturing the material is classified. FOGBANK was produced between 1975 and 1989, and the factory was scrapped in 1993. Fast forward to 2000 when the National Nuclear Security Administration decided how the nuclear weapons that used FOGBANK should remain in service until at least 2040. To upgrade the nuclear weapons, more FOGBANK would be needed. The problem now was that few records remained how to manufacture the material and almost all personnel who had expertise in its production had either retired or found other companies to work for. Since the old factory was gone, a new factory had to be built. But as the production of the material involves toxic materials, which presents a hazard for workers, the new factory was delayed. It was also difficult to reproduce the original material so $23 million was invested to find an alternative to FOGBANK. But an alternative couldn't be found. Eventually FOGBANK could be produced again, but it took eight years from the decision to upgrade the nuclear weapons until the first nuclear weapon could be upgraded.